Headlight wasn't leveling - Fixed! Last edited by timmahh; 07-12-2015 at 06:39 PM. I wonder how that thingy got disconnected? Last edited by BKV122; 02-27-2011 at 12:07 PM. OK so I went ahead today since it was a warm sunny day here in NY to pull my headlight out (removed bumper, headlight washers etc.) to see what was up. Well I found exactly what the OP found with the servo arm out of the socket as i tried to put the arm back into the socket it just wouldn't reach. 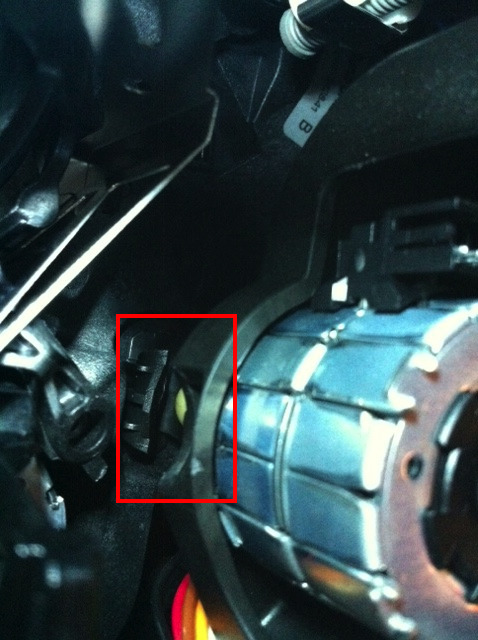 Upon further observation i found that the manual adjustment screw/control arm was broken (circled in red in picture). Don't think its fixable other than buying a whole new assembly. So i lifted by the xenon bulb area to pull the whole inner guts uip so i could try and get the servo back into the socket which i was successful but when i put everything back together still no good with the auto level (it does a little more now but not what it used to do. I will possibly replace the housing at a later date now that i know what the problem is and what i gotta do. Thanks for the info timmahh, I would have brought it to the dealer in a few days to have them probably tell me exactly what they told you that everything is fine. Are the cornering/turning/auto-leveling headlights standards on the e92 or are they part of the premium package or something? Are you under warranty still? Where exactly are you seeing that broken part? The adjustment screws start at the back and have a long thread to the front which I believe connects to two little arms (u/d, l/r) that then snap around a plastic white "+" like your picture. My DRL/Hi-Flash was also messed up and out of whack! Should be std. on 335, comes w/ premium package on 328 I think..
Last edited by timmahh; 02-27-2011 at 07:42 PM. That broken part is that white "+" its a clear break when you see it in person. I believe that "+" is suppose to be connected or part of the white thing above the gray threaded rod which slides that white thing in the upper left corner of the red box back and forth. Last edited by BKV122; 02-27-2011 at 10:29 PM. This is good information! There should be a copy in the DIY forum. When you were playing with it did you notice if that clipy-metal thing moved with manual adjustment? I recall seeing a plastic + thingy on mine and everything worked fine. I think the adjustment screws are both gray, don't think the end of them would be white.. I pulled the bumper off, pulled the light out, and had it fixed and back together in an hour thanks to this write up. This definitely needs to be a DIY!!!! this only works if there is no error code on ur dash correct?? This definitely needs to be a DIY!!!! so i see most of this is dedicated to the vertical problem. Is it the same principle, control action for the horizontal motion? 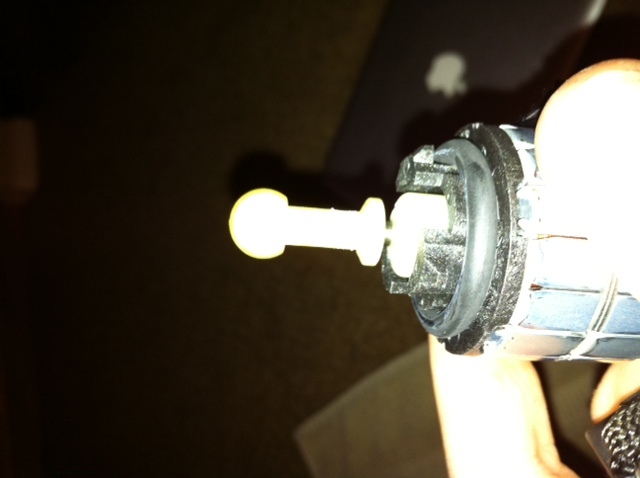 I.e identical plastic "+" piece that controls the movement. 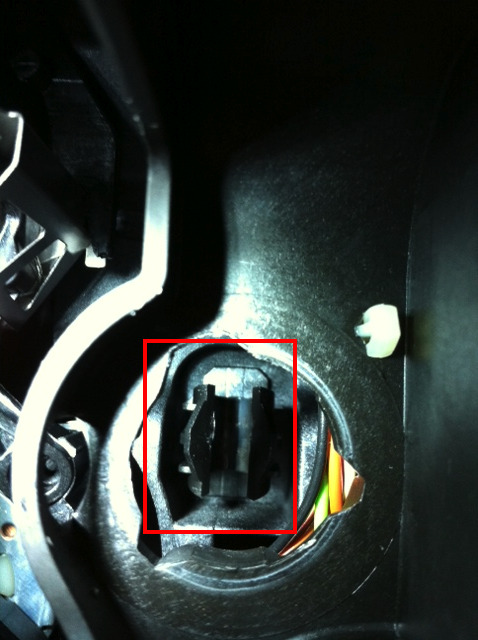 Should be similiar but on the outer portion of the housing, the input control device for steering response is attached front left suspension components, there's a small arm connected to it which can break and cause issues as well. Check that first before proceeding to remove bumper/headlight(s). just remove the plastic wheel well inside and it should be between the headlight and fender reflector? or more towards the engine? The only adjustment screw that I have been able to access is the left-right on the top of the headlight. Up/down is covered by a support bar. I think you have to remove the headlight to adjust horiztonal, and you definately have to remove it fix the servos/adjustment arms within the headlight. It makes zero sense that you cannot adjust the up-down of the light when it's installed, someone said remove the rubber stopped for the hood, but there's no access from there. Where do you stay at in NORCAL?! Mine are only auto leveling up and down, but they dont seem to be moving left or right. Maybe you could help me out? And yes theres a adaptive headlights icon showing. Just to let you all know you can fix this issue without taking front bumper off and take headlight assy out. Just take front portion of wheel wall cover off, take off xenon bulb assy cover in the back off headlight assy and move whole xenon bulb assy bracket up or down depending if your light is pointing up or down. Put xenon bulb and wheel wall cover back on and you are done. It shouldn’t take more then an hour. Who has 2 thumbs and is going to try this fix? THIS GUY. I tried this today and it's not that simple. You can't see f-all. Better off removing the bumper IMHO.